The art exhibition TOUCH ME: I Am Violent, opens Thursday February 13 2014 at Vermillion Gallery and runs through March 8. Curated by Yonnas Getahun, the show is full of art that’s intended to be touched and felt. My piece is called “The Imp of the Perverse,” and is a collaboration with Demi Raven, who did all the software design and programming, and was a stalwart and brilliant co-developer of the work. The Imp is displayed simply, with a knife. It’s plugged in. None of the buttons are functional, but they bear modified labels: SO, WRONG, SO, RIGHT. 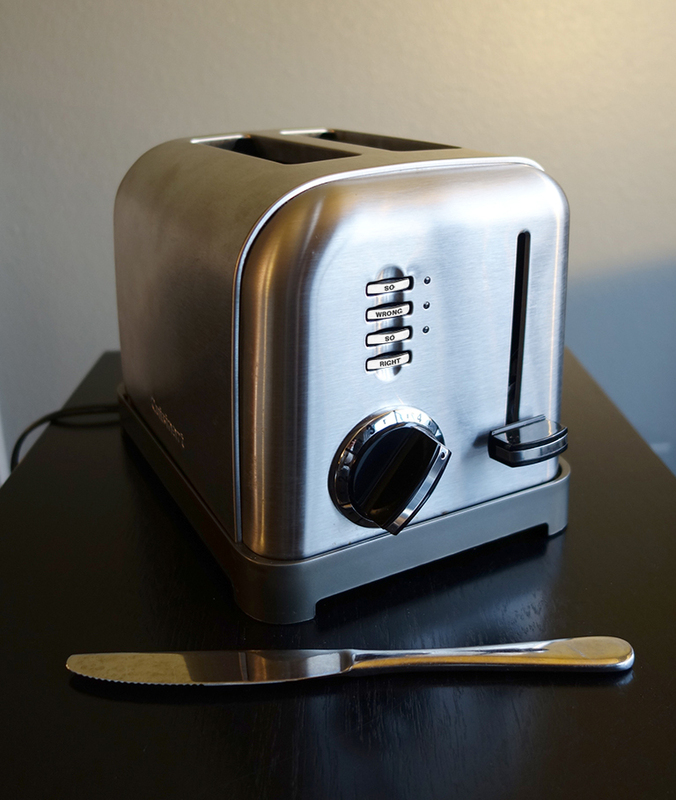 I’m not telling what happens if you go against all your childhood lessons and put the knife in one of the slots, or your finger, or hand… but if you do it right you will develop a closer relationship with that toaster. The name (and concept) comes from Poe’s short story of the same name. TOUCH ME : I am violent features Tariqa Waters, Siolo Thompson, Christopher Shaw, Daveda Russell, Lucien Pellegrin, Jennifer McNeely, Greg Lundgren, Kat Larson, Janet Galore, Ellie Dicola, Crystal Barbre, Sharon Arnold and Megumi Shauna Arai. The concept is born out of the wall that exists when experiencing art. The first rule is not to touch the work. Rightly one of the purposes of exhibits and museums is to sustain and protect the work. And touching expedites the process of deterioration. This exhibit will permit the transformation of the works through touch as well as allowing these superb Seattle artists to create 2D, 3D or performances that express ideas, stories and effects through contact.